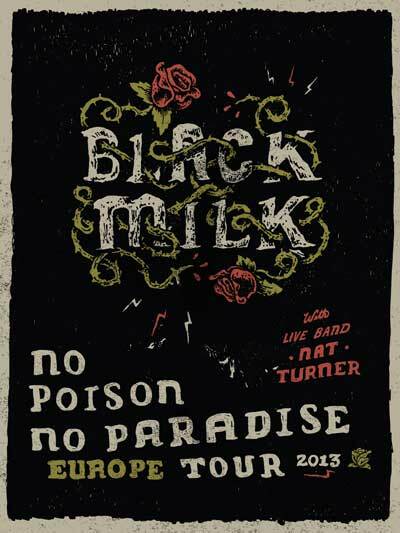 With his recently released No Poison No Paradise album being welcomed with critical acclaim, Black Milk has announced that he will extend his current tour to Europe. The legendary producer/emcee, along with with his four-piece band called Nat Turner, have almost completed their 28-date national tour, having made notable stops in Los Angeles, New York, and Detroit, Black Milk’s hometown. The 13-city European leg of the tour will kick off in Rotterdam, Netherlands on November 15 with Black making his final stop in Berlin, Germany on November 30. The North American leg of Black Milk’s No Poison No Paradise Tour with Quelle Chris and DJ Sober is currently underway. Check below for remaining US tour dates and the upcoming Europe dates. Please contact Michelle or Dan if interested in talking with Black Milk. Black Milk is a producer and rapper born and raised in Detroit, Michigan. As one of the most-celebrated auteurs of his generation of hip hop artists, he has conditioned fans and critics to always expect the unexpected each time he releases new music. Few producers have earned the notoriety and respect he has as a musician, and when that is coupled with commanding talent as an emcee, it’s no surprise that his solo releases are met with exalted anticipation. He has been making music professionally since 2004 and has collaborated with many noted artists including Slum Village, J Dilla, Elzhi, Phat Kat, Frank-N-Dank, Lloyd Banks, Canibus and Pharoahe Monch and Jack White of The White Stripes. In 2010 he released Album of the Year, which perfectly captured his soulful, jazzy style. His fifth solo album, No Poison No Paradise, is available now.